If the risk assessment indicates that employees may be faced with life-threatening incidents or where they might have to manage illness, injury, poisoning or burns then the FAW is the course that meets this need. 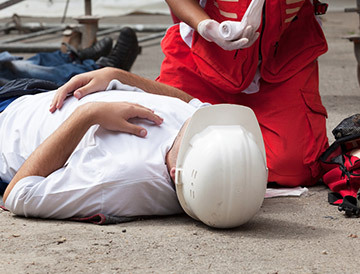 Topics include; roles & responsibilities, dealing with collapse (with and without breathing), choking, bleeding, shock, seizures, minor workplace incidents, major illnesses, common and serious workplace injuries, poisoning, anaphylactic shock, burns treatment, eye injuries and using first aid kit. Typical delivery methods are predominantly practical and the course is assessed by continual observation of candidate performance and three brief Multiple Choice Questionnaires.